Last edited by Evolevos; Apr 7, 2019 at 11:24 AM. That's pretty close. Does English's dyno read "close" to other DynoJets? I know some shops have lower-reading dynos. If this is one of them, then you would be right where you should be. If not, e85 would get you to 400whp easy. If you are stuck using pump and methanol, then you would need to up the meth %. That giant FMIC isn't doing you any favors, either. Either way, you are really, really close to reaching your goal (if you haven't already). As long as the car is fun to drive, no worries! 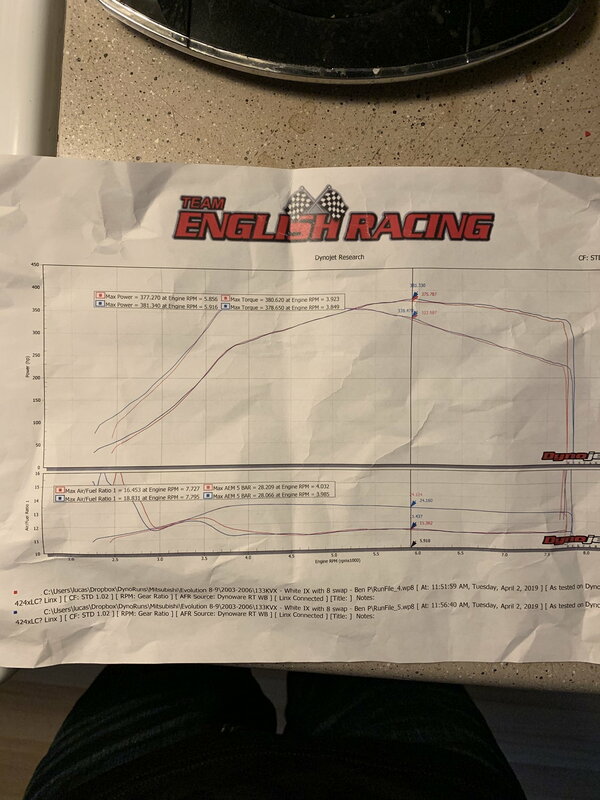 im not sure with English racing how there dyno reads to be honest I know it’s a pretty big fmic core but I plan to go to fp red down the road..
you will be fine on the stock bottom end , they limit the torque and English is one of the best out there tuning evo’s so you have no worries. As previous mentioned running E85 would get you there. Also just adding a FP green would probably get you there. The red and blk that was previously mentioned would too. Running E85 would require bigger injectors @ 1000 cc min unless you already have them installed. Your tune would have to be torque limited as English is well aware of on stock bottom end motors. Don't want to throw a rod. "wow this car accelerates fast!" ....wait for it.... ..here it comes.... "okay, now weeeeee!" **edit: that scale is horrible on the mobile app. Last edited by kaj; Apr 7, 2019 at 02:23 PM. Why did you put evo 8 head on? What does your car put down on pump 92? Dynojets don't really read "differently" from each other like other dyno brands. Differences larger than a couple percent from another dynojet would be due to atmospheric conditions and elevation. Is that Stock EVO 9 RS turbo that comes with Magnisium Compressor Wheel? I also Have Evo 9 Turbo with mC in the part no. But I am not installing it because I read it cant hold Boost above 1 Bar.